Christine Lucia is a "Fiction and non-fiction writer, and music professor" as detailed at her website, http://christinelucia.co.za/. Prof. Lucia is the Guest Author of the Michael Mosoeu Moerane Biography at Africlassical.com. She is fully responsible for the extensive research required for the Biography. We gratefully acknowledge her generous contribution. Michael Mosoeu (‘Mike’) Moerane was a composer, pianist, teacher and conductor. He was born on 20 September 1904 in Mount Fletcher (South Africa) to an evangelical priest, Jacane Moerane and his wife Sofi. His younger siblings included Epainette, who became the wife of ANC leader Govan Mbeki and mother of future South African President Thabo Mbeki. The family lived on their own farm, which was taken away from them in the white South African government’s land reforms of the mid-20th century. The family was Sesotho-speaking, and Sesotho was the language of most of Moerane's song texts and the one that he later insisted his own children speak at home. After primary schooling at a Catholic mission Moerane enrolled at Lovedale Missionary Institution where he passed the Junior Certificate. In 1925 he enrolled at the South African Native College (later called Fort Hare University) and obtained his University Matriculation Certificate in 1926, the same year in which he began teaching at the Lovedale Training School. By 1930 he was on the staff of Lovedale High School. The subjects Moerane later taught in Basutoland High School in Maseru, Lesotho (late 1930s), the Bantu H.S. in Queenstown, South Africa (1940s-50s), Mfundisweni Institute in Pondoland, South Africa (late 1950s) and Peka H.S. in Leribe, Lesotho (1960s) included English, Sesotho, Latin and Mathematics. The choirs Moerane conducted were extra-mural, and in Queenstown and Peka he had a small orchestra, teaching his pupils all the instruments (donated from overseas). His players included the young Thabo Mbeki in Queesntown and Zakes Mda in Peka. Moerane registered for a Bachelor of Music degree part-time in 1930 through the University College of South Africa, passing eleven subjects over five years. Meanwhile, he married, his first children were born, he taught full-time, and he began composing. In 1941 he completed the B.Mus. degree - the first African composer in southern Africa to do so and one of the first B.Mus. graduates at Rhodes University (a College of Unisa) - with a ‘Composition Exercise’ called Fatše la Heso (Sesotho=My Country). He received help with its composition and orchestration from Rhodes’ head of music, Austrian-born composer Friedrich Hartmann. Not all of Moerane’s output of 60-70 works has survived and much of what does is unpublished. He focused on choral music in tonic solfa notation and his first publications in the 1930s, by Lovedale Press, were Liphala (Sesotho=Horns) and an arrangement of Nobody Knows the Trouble I’ve Seen. (He made several other arrangements of spirituals.) In 1936 he wrote a set of 10 solo piano pieces in staff notation called Album for the Young (lost), and throughout the 1940s, 50s, and 60s he continued writing much music for choir and a few instrumental or piano pieces (lost). His best-known choral works, frequently prescribed at choral competitions in South African and Lesotho are Ruri (Sesotho=Truly), Sylvia, Della, and Matlala. This 10-minute tone poem is scored for full orchestra including triple woodwinds, 4 horns, 3 trombones, 3 trumpets, tuba, cymbals, triangle, piano & harp. The composer told Percival Kirby that it “is built mainly around three traditional African themes - a war song, a work song and a lullaby” and that it was accompanied by what he called “a more or less adequate analysis”. The folksongs pull it in a tonal direction while the harmonic language is modernist and the orchestration romantic. As a student work by a largely self-taught composer who did not grow up in a compositional or orchestral environment, Fatše la Heso is extraordinary. The external examiner of Moerane’s portfolio, composer William Henry Bell from the South African College of Music in Cape Town, told Hartmann ”he never had expected such a work to be written in South Africa, and less so by a Native” [sic]. The work was premiered by the BBC Symphony Orchestra in England in 1944, conducted by pianist Clifford Curzon. The first recording of the work by the BBC in 1944, conducted by Clarence Raybould was destroyed. Dean Dixon premiered the work in New York and Paris, and a commercial recording by the South African National Symphony Orchestra (SANSO) conducted by Edgar Cree in 1973. 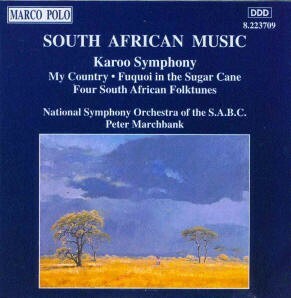 The last recording (shown here) was made in 1994 by Peter Marchant and the SANSO. 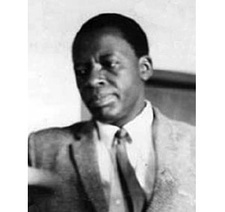 Moerane lived his life between Lesotho and South Africa, his movements often dictated by political involvement and harassment by the authorities. Moerane joined the Non-European Unity Movement in 1943, which was more radical and uncompromising than the ANC (this seems to reflect his personality) and believed in a policy of non-collaboration with any government structure. Probably as a result of his views, he had little time for parastatals such as the South African Broadcasting Corporation, who are often responsible for what little information about his life is officially available. He thought of himself as Basotho, a staunch Protestant and a classical musician. (He hated jazz: in Queenstown his next-door neighbor was Todd Matshikiza, composer of the musical King Kong, whom he scorned.) Moerane’s six children were all brought up musically and several of them learnt the piano, at which Moerane was very proficient, and his youngest son, Thabo (1947-2006) even more so. Moerane was a strict teacher and conductor and occasionally adjudicated competitions where his songs were prescribed. He spent his last years at home in Tsifadimali, Lesotho, and died in hospital in Bloemfontein, South Africa on 27 January 1980. He is buried in Tsifadimali.